Payments Canada’s mandate includes fostering and enabling innovation in the Canadian payments ecosystem. To do this, we are working to understand and define the complete electronic payments ecosystem and value chain in a way that captures the innovations of the past and the future—and helps to provide a common frame for payments specific policy, regulation, investment and innovation. A paytech is an organization that uses technology to enable the electronic transfer of value. Paytechs are fundamental to the vibrancy of the Canadian economy. The better payments work, the more efficiently Canadian value can move. Canada has long been a paytech leader—driven historically by Canadian financial institutions and global payment networks. But today we are also seeing many new entrants in the form of startups, and established players in other sectors, adding significant value to the ecosystem, and ultimately the Canadian economy. Improving payments requires specific skills, unique research, motivated investors, focused public policy and careful regulation. So, it’s important that we think about, develop, promote and adopt paytech distinctly from other financial technologies. As technology changes quickly, and the diversity of actors in payments grow, it’s important to take a fresh look at the ecosystem—one that organizes based on function and principles, and not technology or operations. Beneath the simple notion of a payment—transferring value from one party to another—is a deeply intricate network of organizations, technologies, regulations and interests. While Payments Canada plays a critical role, so many other actors are essential for the safety, flexibility, speed and convenience of Canadian payments. There are three high-level groupings of roles in the payments ecosystem—Transaction, Enabling, and Supporting. Within Transaction, there are four layers a payment travels through on its journey from decision-to-purchase to finality—as well as the Adoption Layer, which must be used at least once for a specific payment type by both the payor and payee. Each layer is filled with many actors that perform a needed function. While it’s helpful to distinguish the essential roles in a payment, in many cases, we find organizations and their technologies spanning multiple layers—either discretely or as a contiguous part of the value chain. The process of enrolment in a payment type that establishes the capacity to make payments (as a payor) or accept payments (as a payee). Adoption takes place distinctly from a transaction, and is required before a payment can take place. Where a payor and payee interact with a payment. This includes all activities from the decision to transact, to the selection of a payment type and initiation of the exchange, as well as notifications throughout the value chain and the subsequent reconciliation of the payment. Where the need, and ability, to transfer value is communicated to and from a ledger. Payment requests are both transmitted and confirmed (or denied) by actors in this layer. The accounts in which value is tracked, where value is debited or credited during a transaction. These can range from traditional bank and credit card accounts to the distributed ledgers of cryptocurrencies. 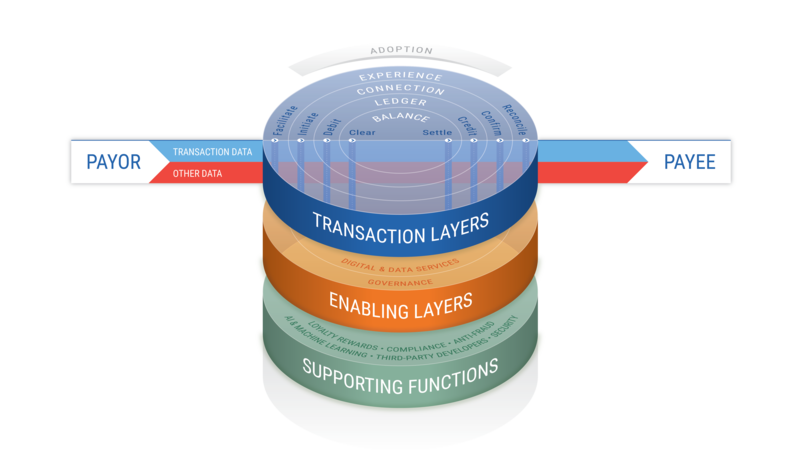 In addition to the Transaction Layers there are other essential functions that enable payments. These functions provide support across the value chain. Data & ID: Various directory, registry, data analysis and digital ID services that help to improve the safety and convenience of a transaction. With emergence of data-rich payments and digital ID technologies, this layer is growing in relevance. Governance: Various bodies that provide laws, rules, guidelines and policies that govern payments. Finally, the ecosystem relies on Supporting Functions that include—but are not limited to—Artificial Intelligence (AI), Third-Party Developers, Security, Compliance, Anti-Fraud and Loyalty Programs.